Recycled Into Art: Cat Food Cans & More! The Story Behind: Eggs & "P.Y. Pysanky"
from tumbleweed. Each link of the chain is handmade and hand-hammered from copper wire. are especially labor intense... but it's a labor of love for certain! 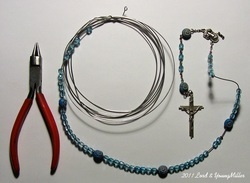 made with salvaged beads and chain; broken necklaces, old rosaries missing parts, thrift store finds. As with our art, most of them will be a "one-of-a-kind" piece. 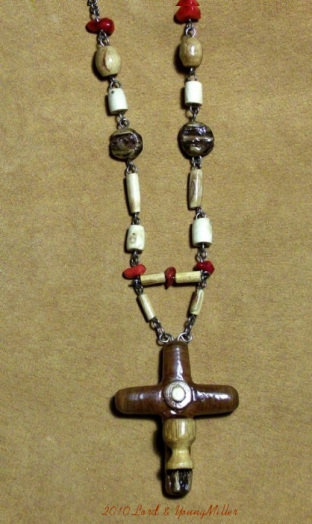 For David... Cottonwood beads and arrowhead with an Apache Tear inset. 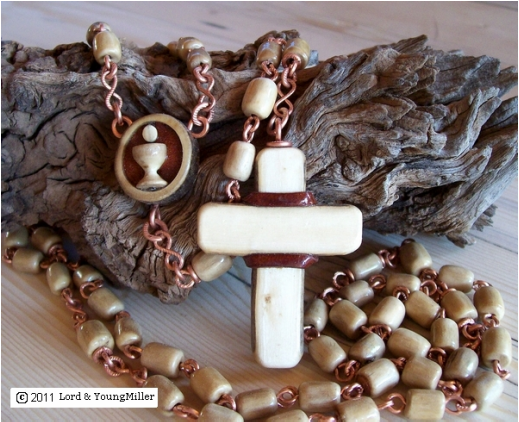 The tear has a tiny copper cross (sealed to it with acrylic) which can be easily seen when light passes through the stone. Finished with hand-hammered copper, suede & deer skin leather. 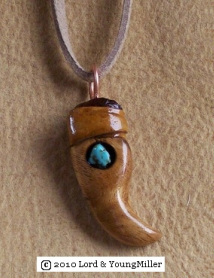 Elsie's Apache Tear pendant (below) was created in a similar fashion. Thank you both!... 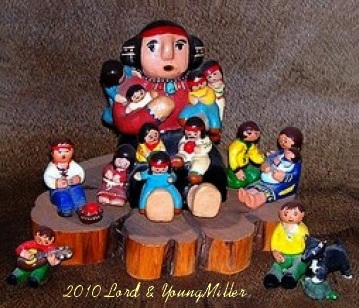 for the Apache tears and other rocks & minerals! Wall cross, approximately 29" tall, donated as a raffle item for "Relay For Life"on 5/6/11. 3 large turquoise nuggets, copper and 3 bright parrot feathers. Multi-layered wall cross of cottonwood, mesquite and leather. a shelf for a wolf lover! An arrowhead carved from cottonwood with two rattlesnake ribs framing rattlesnake skin. The white beads have rattlesnake vertebrae embedded in them and the yucca discs have bull snake skin. black bear fur capped with deer leather. Kay happily wearing a carved arrowhead necklace & earring set; one of our early creations. 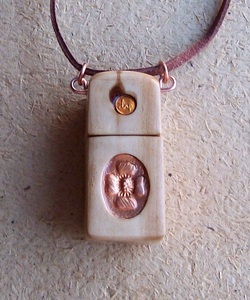 Pendant of San Pedro River cottonwood with copper inlays. Top unscrews to reveal small pill bottle. 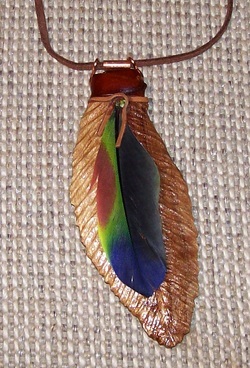 feather carved of cottonwood, with mesquite beads, deer skin wrap and a turquoise nugget. Chain hand-hammered from 18 ga copper. Oh daughter! 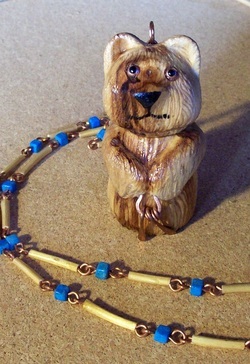 Stung by a scorpion, you brought the mashed critter for us to see... and we gave it's tail BACK to you in a keychain! Unscrew the cottonwood bear's head to reveal a tiny nitroglycerin pill bottle! 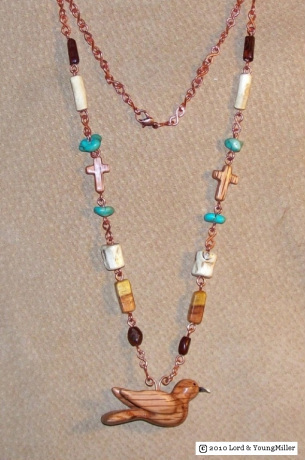 Chained in copper with tumbleweed beads and reconstituted turquoise. 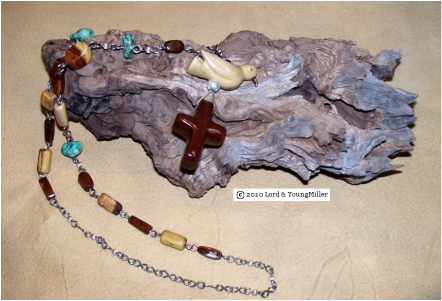 cottonwood cross with mesquite cross inlay - turquoise nuggets and beads of mesquite, cottonwood, devil's claw, tumbleweed, cat's claw, century plant and desert broom. Happy Birthday 2009!... Wanting to make a SPECIAL gift for the occasion, a prayer was sent up before making a collecting trip trip near the river - and that prayer was ANSWERED!... A beautiful turquoise nugget was found! Washed smooth by the waters, it required little work or polishing before being inset in the cross. 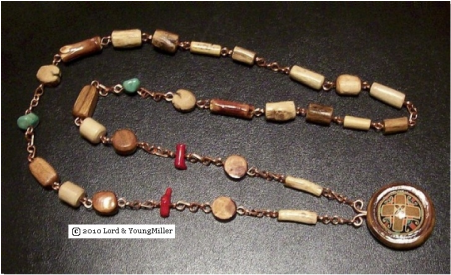 Windchime of yucca, tumbleweed and glass beads / chained in copper. The chimes are brass bullet casings and make a delightful sound! 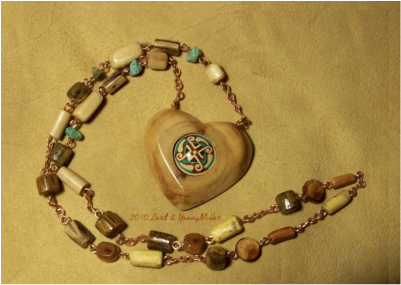 cottonwood heart with eggshell inlay - beads of various woods with turquoise nuggets - chained in copper. One half of a REAL chicken egg decorated pysanky style and inlaid in cottonwood. Copper hooks. The eggs have been internally strengthened and are highly break-resistant. Based off a sketch we drew for a children's book (but never finished writing! ), "Forest Storyteller"